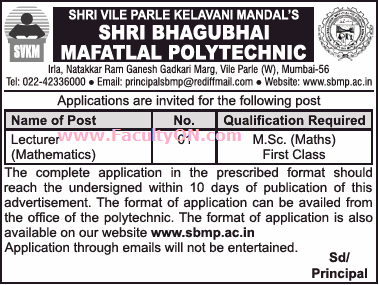 Shri Bhagubhai Mafatlal Polytechnic, Mumbai has advertised in THE TIMES OF INDIA newspaper for recruitment of Teaching Faculty - Lecturers jobs vacancies. Interested and eligible job aspirants are requested to apply within 10 days from 01st August 2018. Check out further more details below. About College: Shri Vile Parle Kelavani Mandal established this Polytechnic in 1963 with a munificent donation of RS. 7,50,000/- from Shri Arvind N. Mafatlal and his brothers and named the same after their uncle Shri Bhagubhai Mafatlal. Mafatlal family and their industries have taken keen interest in developing the same and given financial support which stands at RS. 43,26,000/- at present. The Polytechnic receives Grants and Project fund from the State and Central Governments for establishing facilities and developing its infrastructures. How to Apply: Interested and eligible candidates are requested to send their filled-in application (blank application format can be obtained from the college office) along with necessary photocopies of certificates and recent photo to the following postal address. Application form is also available on college website. Email applications will not be entertained.